Continuing on the theme of recent literature on property, I'd like to talk about a great book that has just appeared: Broken Trust: Greed, Mismanagement, and Political Manipulation at America's Largest Trust, by Judge Samuel P. King and Professor Randall Roth. Of course, I'm coming late to this discussion, because Gerry Beyer and Paul Caron have already praised Broken Trust. This is a story of epic battle, of the power of charitable trust, of political corruption, and redemption. In short, of life itself. And you and your wills students will love it. Where to begin? 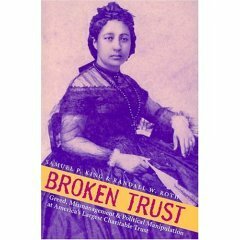 Perhaps with the establishment of the trust by Princess Bernice Pauahi Bishop's will in 1884. She placed her property in trust for a school to benefit the children of Hawai‘i: the Kamehameha Schools. You may have seen discussion of the Kamehameha Schools recently, because the ninth circuit's rehearing en banc a lawsuit challenging their admissions policy. Property professors will recall that it was this trust's ownership of about one-ninth of the land in Hawaii that led to the passage of the Hawaiian Homes Act in 1969, which led in turn to Hawaii Housing Authority v. Midkiff. And after the Bishop Trust (though its trustee, Edward Midkiff) lost, they ended up with a huge portfolio--in excess of two billion dollars. (Little bit of interesting history here--when the trust was established in 1884, its holdings of about 380,000 acres were worth about $470.000. Talk about a good investment.) After the trust was forced to sell land, it ended up with lots of cash. That led in turn to all sorts of problems, as the trustees--who operated under no meaningful oversight--began receiving nearly one million dollars a year in trustee fees and operating the trust as their own fiefdom. Couple of things that are interesting to property scholars here: the way the case against the trust was pieced together. There were some lawsuits involving the trust. Check out this self-dealing: one trustee represented a golf club near Washington, D.C., when it purchased property FROM THE TRUST. That impropriety might have remained unknown, except that the transaction ended up in litigation. In another case, trustees invested the trusts (as well as their own money) in an oil exploration project, without disclosing their investments to other trustees. Again, litigation led to the disclosure of that. Then there's the story of the way that increasing pressure, from members of community (including University of Hawaii Law Professor Randall Roth) who investigated and reported on the abuses led to reform. They worked in conjunction with members of the community to bring down the trustees. The attorney general became involved, so did the IRS. It's a story about arrogance and self-dealing and an optimistic story of integrity, too--on the part of teachers, who were subject to dismissal, students, and other members of the community. Those brave souls brought about important reforms of the trust; Professor Roth in particular is my hero, for having the courage to take on the trust, despite the risk of political and other consequences. It's absurdly hard to write a book about trusts that is exciting, but Randall Roth and Judge King have done just that. And some of your favorite wills scholars--Edward Halbach and John Langbein-- make appearances, too. I highly recommend it to you and to your students; it's well worth assigning to your wills class. And I hope you'll add it to your summer reading list. You'll enjoy it--trust me on this one.